Central apartment, all renovated in 2018. 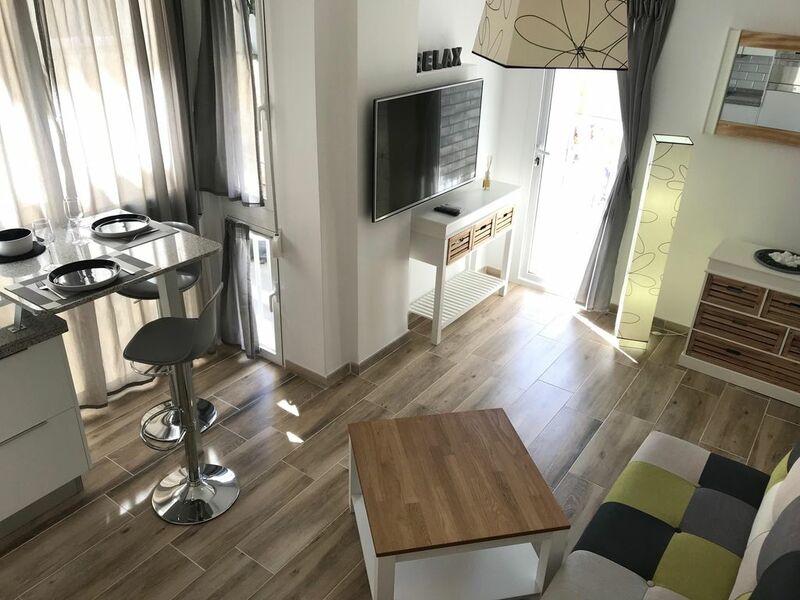 Modern apartment on the first floor of a building 200m from the Castle of Santa Barbara, 300m from the Market and Bullring, 500m from the Historic Center. Ideal location to visit the city of Alicante on foot during the day (shopping, culture, history ...) and the night (bars and restaurants). At only 10/15 minutes walk, we can enjoy the Port of Alicante and Playa del Postiguet. At 300m there are good connections to the Airport (bus, line C6) and the TRAM, to visit different places on the coast (Playa San Juan, Benidorm ...). In the streets around the building, parking is free, availability according to schedules. The apartment tastefully decorated with high-end furniture, is to be released, since the reform was completed in January 2018. 50% payment upon reservation, and 50% 15 days before entry, if requested. It has shower, toilet and sink. There is a small radiator on the wall, for winter. It has a hair dryer too. Apartment renovated in January 2018. Jessy is a great host. Very welcoming and friendly. He assists you with all concerns, especially getting around the city. The apartment was fantastic, just what we required, it is compact with all essential facilities, beautifully clean and very modern. Based in a quiet street, so close to the all amenities; local supermarket; tram station and local buses. You are only a few minutes to the town and the Marina and Beach. I do highly recommend this host and apartment in Alicante. Great Time was had. Thanks for the comment David, really appreciate it. Very glad you both had a good stay in Alicante. Was a pleasure having you, and you will be welcome again anytime. Guests highly recommended to any Homeaway hosts. The owner Jessy is very friendly and helpful. The apartment is very clean, compact and has everything that is needed to make your stay pleasant and comfortable. We liked the apartment more than any previous ones that we rented in Alicante. Location is great and we always felt safe walking in the area and the little streets. Highly recommended! It was a real pleasure having Donald and his wife Saodat for such a long stay. Perfect guests, very friendly, discrete and polite. They left the apartment in perfect conditions. It will be a pleasure to see you again in Alicante. Highly recommended guests. Fantastisk helhedsoplevelse. Lækker bolig, hjælpsom vært og gode velfungerende facciliter. En lejlighed beliggende perfekt i forhold til både centrum og stranden (gåtid ca. 15 min.) Stille sidegade. Helt nyt og velfungerende inventar- hvor intet manglede. Hi Lotte and Jens, was a pleasure having you as guests. Really glad you enjoyed your stay in Alicante... really active holidays, you have seen and done so many things in a week, I’m impressed. Friendly guests highly recommended to any Homeaway host. Ho soggiornato con mia moglie 4 notti in questo appartamento super moderno, la posizione è ottima per visitare la cittá, il proprietario è super premuroso e gentile. Appartamento pulito, non manca assolutamente niente, è come stare a casa propria. Wir waren vom 29.08.2018 bis 07.09.2018 in der Ferienwohnung von Jessy. Die Wohnung ist sehr modern und sauber - genau wie auf den Bildern abgebildet. Es gibt alles was man benötigt und viele Extras wie Tee, Kaffee, Shampoo, Duschbad, Waschpulver uvm. Außerdem war Jessy wirklich sehr hilfsbereit und zuvorkommend - wenn nötig konnte man ihn bei Fragen, Problemen etc. nahezu jederzeit kontaktieren. Wir würden die Wohnung auf jeden Fall wieder buchen! Einfach ein super Preis-Leistungs-Verhältnis! We were from 29.08.2018 to 07.09.2018 in the apartment of Jessy. The apartment is very modern and clean - exactly as shown in the pictures. There is everything you need and many extras such as tea, coffee, shampoo, shower, washing powder and much more. In addition, Jessy was really helpful and obliging - if necessary, you could contact him at any time with questions, problems, etc. We would definitely book the apartment again! Simply a great value for money! An amazing apartment, an amazing and helpful host, and a more than perfect stay in Alicante!